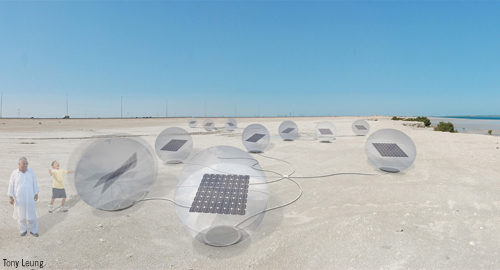 These inflatable ‘beach balls’ not only serve as containers for PV films but also an installation interacting with wind, topography and visitors. When inflated, the ball is temporarily stabilized by the counterweighted bottom cap. The PV films that weaved into a stretched membrane is tilted at 25 degrees from the horizon within the stabilized section, which provides better efficiency according to the latitude angle of Dubai (25° N). When deflated, the tile angle of PV films will be zero. Each film contains 3m2 of PV cells film which gives a maximum output of 200W approximately. Each clear latex ‘beach ball’ measures 2m in diameter. Alternatively, ETFE foil that allows better light penetration could be tested. The base cap contains LED lighting, air valve and silicon cable connectors which provides flexible cable movement. Each unit is color coded to match the color cap of ‘base station’ and should be carefully weighted to offset the weight of PV films above. 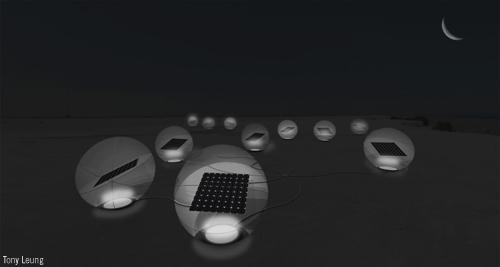 At night, these ‘beach balls’ will be illuminated by LED lighting installed on each base cap, producing a moving lightscape along the highway. Each base station is equipped with air pump, inverter and battery. These stainless steel units are buried 1m underground to provide anchors for five to six ‘beach balls’ and to convert electricity from DC to AC for storage or transmission to electric grid.